MOSUL PROVINCE IRAQ/AL-HOL SYRIA - In October 2016, Umm Aysha and her three children huddled on the ground outside a bombed-out shopping plaza with a crowd of other women, all wearing the black veils required by Islamic State militants. They were on the outskirts of Mosul city in Iraq, fleeing a battle as Iraqi, Syrian and coalition forces pummeled IS across the region from neighborhood to neighborhood, city to city and village to village. Our house was bombed, she told VOA, explaining why she fled. That battle subsided and bit by bit, IS lost the lands they captured over the previous three years. On Saturday, after five years of fighting, the militants lost their last sliver of land, a bombed out camp in Syria. What was once a self-proclaimed Caliphate, occupying vast territories in Iraq and Syria and bent on the destruction, is now once again an elusive insurgency. But besides broken hearts, homes and families, IS is leaving a new threat in its wake, said Badran Chiya Kurd, an advisor for the U.S.-backed Syrian Democratic Forces, which declared the final victory. Militants are regrouping and hope to continue to attacks in Syria, Iraq and around the world, he said. Recovery for now-destroyed former IS holdings, including major cities in both Syria and Iraq, will require political will, investment and education, according to Kurd. If cities and towns remain in shambles without services or economies to speak of, extremism will continue to thrive, no matter who is officially in charge, he said. If we dont get rid of the extremism, IS can come back at any time and destabilize our lands, he added, speaking on the phone from his office in Qameshli, Syria. Over the last few months, SDF forces battled for Baghuz, the last IS stronghold. Militants fought bitterly as IS supporters poured into camps and prisons, often vowing that IS will rise again. But even back in 2016, when ISs imminent demise was just becoming apparent in Mosul, Umm Aysha could see members of the group plotting their survival. There were two militants wearing veils among the women we came with, she whispered. They were wearing makeup and everything. The next time we saw Umm Aysha was only a few weeks later in November 2016, but we didnt recognize her at first. She had cast off the black full-body and face veil and replaced it with a pink headscarf and a smile. She was at one of the camps housing displaced families in northern Iraq, and the weeks without bombings had been a relief. The camp was quickly filling up and others were opening across Iraq and Syria. Millions of people would flee their homes as the fighting continued. Its this one, she said, showing us the tent her family would make a home for the winter, despite the increasingly cold and rainy weather. She didnt know then, that this tent would become her only home. Over the course of the next 28 months, IS-held towns and cities fell to Iraqi, Syrian and coalition forces. Thousands of civilians were killed in airstrikes, and the bodies of militants were left strewn across the region. In the final few months of fighting, many of the most devoted IS fighters finally surrendered after retreating for months or years with the group before their 'last stand' in Baghuz. Syrian camps and prisons are now packed with IS supporters, including thousands of foreigners--fighters, their wives and their children--from countries that are hesitating, and in some cases refusing, to take them back. Many areas once occupied by IS have been rebuilt, but many have not. Locals whisper that they still fear IS and describe circumstances that lead to the rise of the group that are still present. The region remains unstable, poor and people often feel neglected by authorities. It was lucky we escaped early, Umm Aysha told VOA in late-February this year as the final battles raged on in Syria. We sat in a small space secluded by tarps and blankest outside her tent, as she held her youngest child. Aysha was born only six months before and has never lived outside a camp. If we had stayed with IS, who knows what my children would be like? Umm Aysha's older three children played in the sun, vying to pose for pictures. They were not in school for different reasons. Marwa is 12, and stays home to help with household chores. Nahida, is 4. I dont have a backpack, she said, explaining why she doesnt go. Mahmoud, 8, finds some of the children at school to be bullies and his mom fears the ones whose fathers were IS fighters could teach him extremist ideas. Of course they will grow up with the same ideologies as their fathers, she said. I tell my children not to talk about these things. At the al-Hol camp in Syria a week later, as IS was in the final throws of battle in Baghuz, children there said they were also not attending school. With about 62,000 new arrivals at the camp since December 4, 2018, the camp is in crisis, short of tents and other far more urgent supplies. More than 90 percent of the newly-arrived people at al-Hol are women and children, and camp workers say they are nearly all related to IS. Several mothers told us they plan to raise their children to support the next generation of IS, and hope their sons will join the insurgency. My children are free to be fighters or not, said Umm Mohammed, a mother of five with her black veil fully covering her eyes. But Islamic State was good. Like Umm Aysha, Umm Mohammed does not know when, how or if she will be able to move her children out of the camp. 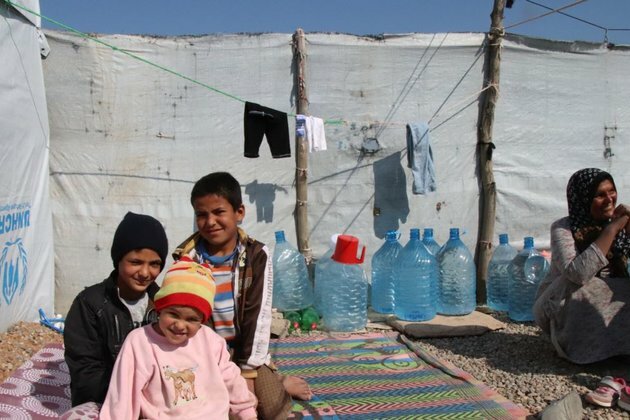 And across the border in Iraq, Umm Aysha says although she fears IS will soon regroup, that is not the real reason she still lives in a camp, more than two years after she fled her home. She used to live in the suburbs of Mosul, but her neighborhood was destroyed and she doesnt have the money to rebuild. Where would we go back to? she asked, shrugging.